A huge chunk of our site is dedicated to the removal of browser hijacker.. The crapware game is getting pretty lucrative and profits for pay-per-install adware are in the millions. It’s not surprising that the malvertisers are going want a piece of the ad pie on Android. Browser hijackers are rarer on mobile devices than on PCs, but they still exist. Sometimes cheaper Android phones or tablets would have a built-in browser hijacker. In this article, we’ve present some methods of dealing with Android browser hijackers. What is a browser hijacker exactly? Are very poor in terms of quality, they lack many must-have features for search engines like a Video, News, or Image searching. Since nobody would use an inferior search engine, developers of adware must rely on browser hijackers to spread their product. You’d be shocked how many people use a hijacked browser instead of simply removing it. Some don’t even notice that their default search engine was changed from Google or Bing to something like SoSoDesktop(.com) or Similarsites(.com). While the problem is most prevalent on desktop computers, it’s still possible for an Android browser to be hijacked. The sad truth is that the Android platform is so heavy on advertising that most crapvertisers don’t even bother with browser hijackers. There are exceptions, however. Sometimes the browser’s search engine can be changed without the user’s permissions. In this case, you should try these few steps to fix the problem. Now you should be able to choose a new search engine. Google, Bing, or Yahoo come recommended. Many viruses spread to older versions of Android. The method applies to almost all other Android browser like Mozilla Firefox, Opera, or other mainstream browsers. If your Android device is running on outdated firmware, it’s much more likely to be infected by browser hijackers or other viruses. If there’s a new update, you should be able to download it from here. Sometimes, .apk files get downloaded automatically while you’re browsing. The Unknown sources option on Android prevents their installation. Browser Hijacking is rarer on Android devices compared to desktop PC, but it’s probable that the problem is only going to get worse in the future. The sad part is that adware on the Android OS is very widespread. Almost every app requires a huge amount of permissions and platform lacks an easily available ad-blocking software. Malvertisers often prefer to simply attach the spyware and adware associated with browser hijackers onto a different type of program, like a keyboard app or an app masking as a legitimate app. 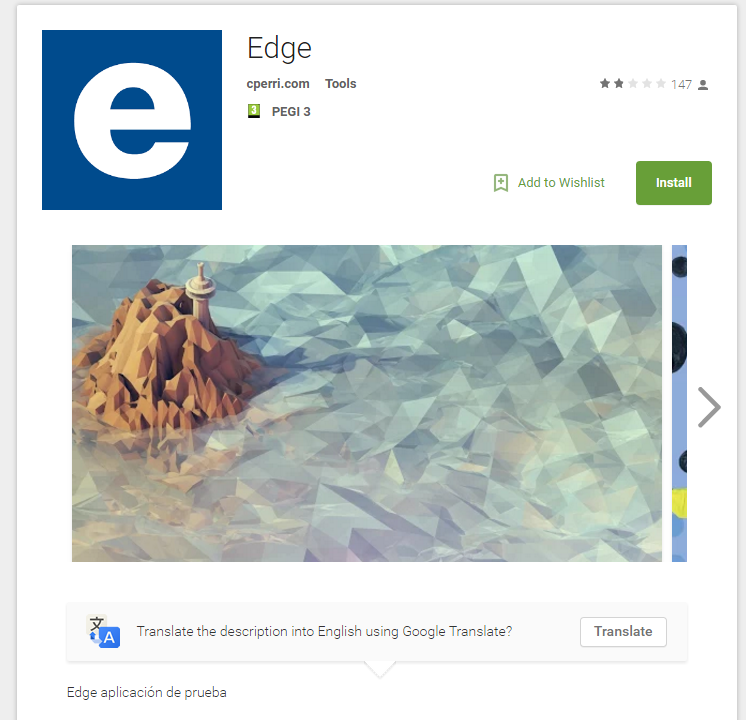 A good example of that would be Edge, developed by cperri.com on the Google Play store. The app requires a massive amount of permissions, and it’s very likely that this data is being used for adware purposes. Edge is made to look like the Microsoft’s Edge browser. Users who aren’t vigilant enough can be tricked into installing it, thinking they’re getting Microsoft’s legitimate browser application, which isn’t on the Google Play store as of now. We have presented more information on the subject of permissions in our Android security guide. The downloading of anti-virus and anti-malware apps on your Android device also comes highly recommended.